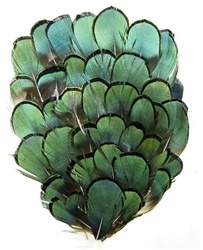 Lady Amherst Natural Black Iridescent Pheasant Pad. A very Nice Natural Black Pheasant pad very much in demand. Very popular for Millinery, Headbands, Crafts , Fashion and other various Accsesories. Sold by the DOZEN only.